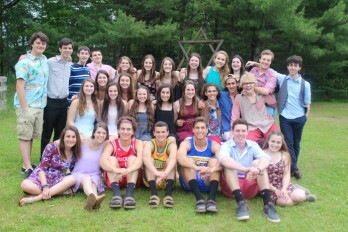 Since 1966, the Ozo program has taught incoming high school seniors about hard-work, building community, Jewish living, child development, conflict resolution, teaching skill building in various activities, counseloring techniques, general skills to jump into any area in camp and be able to fill in, and how to work together to achieve amazing things. Our goal is to have the strongest staff in training program possible. The Ozrim will learn Jewish values, receive leadership training, and ultimately will be trained to be strong Interlaken Camp staff for the summers to come. The Ozrim program is a continuous learning process throughout the summer. While the Ozrim will spend a great deal of time with campers throughout the summer, they are training, as they prepare to become future staff members. First session, the Ozrim are learning. They are in sessions that are taught by their Unit Leaders/Counselors and by many other presenters including the Director, Assistant Director, other members of the senior leadership team, and outside trainers. During these sessions, the Ozrim learn about counseling techniques, cabin management, camper challenges, how to run a chug, writing and presenting programs… all of the attributes that make a great staff member. Guest educators and discussion leaders are brought in to enhance the level of skills and knowledge presented. The Ozrim will move and deliver luggage on the first and last days of camp. They are responsible for Public Nikayon, which is the cleaning of public areas in camp, as well as responsible for the general cleanliness of camp. The Ozrim often will be found setting up benches in Ulam for performances and setting tables in the Chadar Ochel for Shabbat dinner and overseeing that the Chadar Ochel is swept after each meal. As we want the Ozrim experience to be well rounded, you may find an ozo as a server for a cabin during one meal a day, in the kitchen helping prep for a meal, or in the maintenance shop helping with general janitorial work and projects. 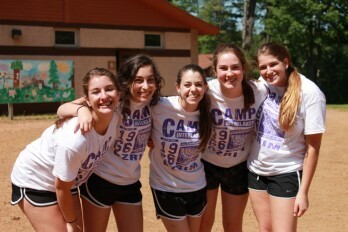 The Ozrim are responsible for planning and executing Maccabiah, Camp’s version of Color War. Ozrim will be assigned to a cabin rotation where they will spend a few days at a time shadowing counselors in different age groups so they can get a feeling for how they enjoy and how they are successful working with different aged campers. They will also be assigned a rotating chugim schedule where they will be shadowing different chug leaders so they can learn what it’s like to teach chugim and help campers develop their skills. Second session, the Ozrim transition into cabins and function similarly to a counselor. They often live in the counselor rooms with counselors, unless there isn’t enough space; they occasionally have lived amongst campers. They are still responsible for Nikayon, general cleanliness of camp, setting up benches, setting tables for Shabbat, luggage, and for planning and executing Maccabiah. They will also be assigned their own schedule of chugim that they will co-lead with staff, as well as an Ozo Chug period, where they will get back together with the Ozo group to continue learning, problem solving or planning. They will also have programming responsibilities where they will have the opportunity to plan evening programs for their cabins, unit or the entire camp. For many of the Ozo applicants, becoming an Ozo is something they have looked forward to for years. Often when you ask people about their experiences at camp, it is the Ozo year that stands out. In order to select a group of people who can succeed individually and together, work hard and have fun, and eventually become successful Interlaken Camp staff members, we have developed the following process. Every applicant fills out an application, writes a personal statement, creates a program, provides three references, and participates in an interview.